This 6 x 6 Waltons shed is windowless, which means that you benefit from great security. Nobody will be able to see inside and look at the contents of the shed. The building also benefits from having shiplap cladding. This not only looks great, but it also provides an extremely strong level of protection against rainwater. The apex roof also adds to its water-resistant qualities, as well as providing a great aesthetic design. 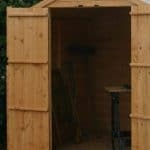 It is a compact shed, but ideal for storing tools and will suit anybody looking for a basic yet high quality storage solution. This is a windowless shed with a classic apex roof. Designed to help with water drainage, the roof is also protected with heavy duty sand felt. Shaped like an upside down V, the apex design also provides more interior height than other types of roofs. Plus there’s the fact that it also has an attractive look. It reaches 2.08m and the eaves reach 1.59m in height. The width of the building measures 1.78m while the depth measures 1.79m. It also comes with double doors which measure 0.96m in width and 1.68m in height. 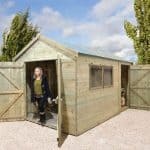 Built with 12mm Shiplap tongue and groove cladding, you can be sure this shed is ultra-durable and extremely water-proof. Shiplap is found on high-end sheds and is the most expensive type of cladding you can invest in. The boards lock together strongly to create a weatherproof barrier. It still needs treating which does bump up the cost, but once treated it provides fantastic year-round protection. Thanks to the tongue and groove aspect, the building also has an expansion gap to allow for climate and moisture changes in the timber throughout the year. This material is also less likely to warp over time and is really thick; making it almost impossible to break into. It comes with a solid frame which provides adequate support. The only thing that lets this shed down for us in terms of construction, is the 8mm solid sheet board that is provided for the floor. A lot of sheds tend to feature at least a 10mm thick solid sheet board. So you may find this floor a little flimsy in comparison. However, included in the cost is a free floor support kit. This measures 28mm so you should find that is sturdy enough to handle everyday gardening essentials as well as bicycles and a lawnmower. You can also upgrade at an additional cost for the extra strength floor support pack. The benefit of Shiplap cladding is that you can choose between water or spirit based treatments. The one we always recommend is the spirit based option. Not only is this actually an essential requirement in order to benefit from the warranty, but it also provides much better overall protection. This is because the product works deep into the wood, creating an internal barrier as well as an external one. The shed has had a water based treatment applied prior to shipping. However, this is only to protect it throughout the shipping process. You still need to apply a further treatment after you have built the shed. Depending upon the type of treatment you use will also determine how often you have to re-treat the building. Spirit based treatments don’t always need to be applied annually which makes them a low-maintenance option. 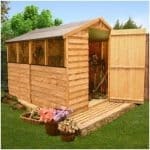 The shed benefits from double doors which is unusual for such a small size model. This basically means you get a generous amount of space to get items in and out of the shed. They feature a great ledge design which means you are free to attach a hasp and staple if you want to. In order to ensure the doors stay shut even in heavy wind, a turn button lock has been provided. The building doesn’t come with windows which you will find gives it a sturdier, more private design. We are impressed by the level of security on this little shed. The only thing letting it down is the turn button lock. This mainly keeps the doors closed; it doesn’t provide a huge level of security against thieves. However, you can rectify this by making use of the 49mm weather-proof padlock upgrade. If privacy is important to you, the windowless feature will definitely appeal. It gives you your own little space and also ensures nobody can see what is stored inside. There is just one customisation option available for this model and that’s the extra strength floor support pack. You might not necessarily need this however as Waltons already provides a free standard floor support pack. This will be adequate enough to suit most people’s storage needs. It adds great strength to the floor and as it comes at no extra cost it would be a good idea to try it out before upgrading. However, if you plan on storing anything particularly heavy then we do recommend investing in the extra strength pack. 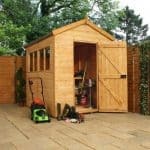 While there are few customisation options, there are quite a few extras you can get to improve the performance of the shed. 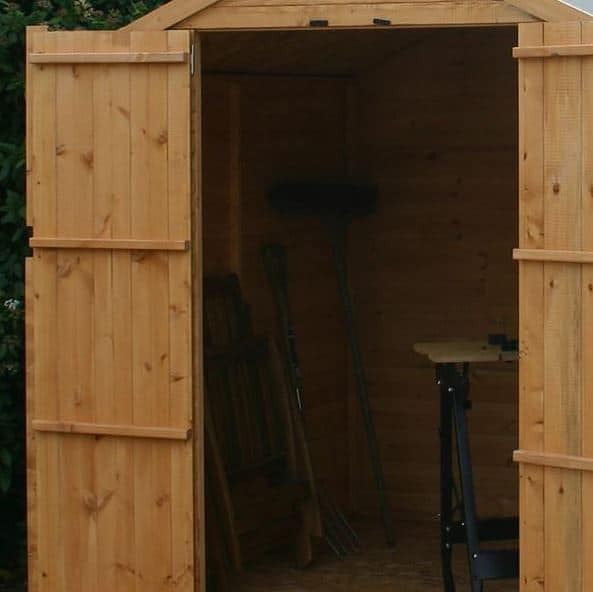 The Waltons 6×6 Portabase is recommended as it ensures you are assembling the shed on a level surface. It also provides great stability to the base, helping to strengthen the floor. 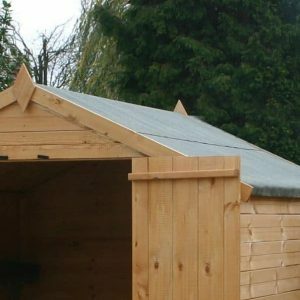 Then there’s the added benefit that it lifts the shed further off the ground, reducing the chances of damage from damp and rot. If you’d like to make the shed more secure, the 49mm weatherproof padlock with hasp and staple is a good investment. It lasts all year round and is created with a hardened steel chrome plated shackle and a steel laminated body. Other extras available include a few different treatments and draper accessories. There isn’t one part of this shed that isn’t built with quality in mind. Only the highest quality materials have been used and we like the attention of detail that has gone into the overall design. 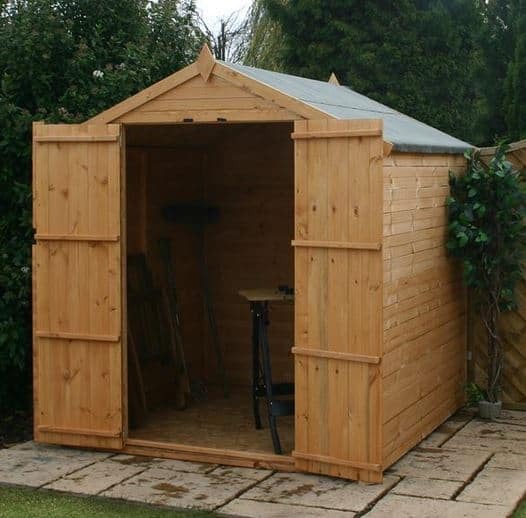 Once treated, the shed should last a minimum of 10 years. Spirit based treatments are more expensive, but they will provide a better level of protection, helping to improve its longevity. This is a small, compact shed so we weren’t expecting much in the way of storage space. However we were pleasantly surprised that the doors open out to reveal a generous storage area. The apex roof also helps to add additional storage height. This is a very simple shed to put together. We still recommend two people assemble the building, but it is possible to do it by yourself. The panels fit well together and if you follow the instructions you shouldn’t run in to any problems. The thing you might struggle with is the solid sheet boards for the roof and floor. 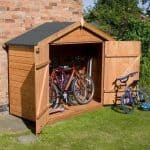 You will notice that the shed is slightly more expensive than a lot of other models in the same size range. 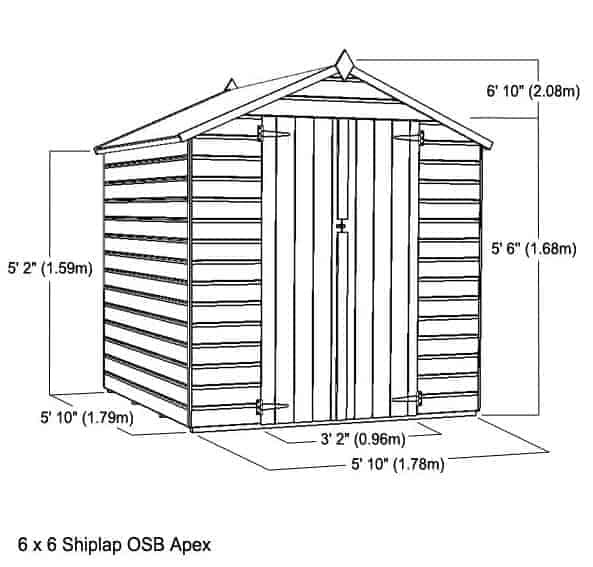 However, the Shiplap cladding and large double doors give the shed exceptional value for money. The only reason we didn’t give it a higher score in this category is because you do have to spend additional money on treatments and extras if you want to make the shed stronger. 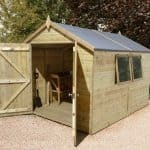 Final Thoughts: This is one of the best compact sheds we have reviewed. While it could do with a stronger floor, overall it has a nice, strong and stable structure. It provides 100% privacy and the pad bolt helps to keep the doors secure and young children out of the shed. Before buying you should take into account the cost of treatments and any additional upgrades you might need. Overall we highly recommend this model and it should fit in all gardens.